For many seniors, fine motors skills diminish over time, making routine activities like brushing teeth, cutting food, and writing challenging. If you’ve noticed that your elderly loved one has increasing difficulty managing daily tasks that require fine motor skills, it may be time to make a change. According to Rhode Island 24 hour care experts, the following activities can help combat a decrease in manual dexterity and promote continued senior independence. A stress ball, specifically designed with stiff but smooth material, can provide an easy way to help your senior loved one build up strength in the fingers. Ask your loved one to alternate holding the stress ball in each hand and gently clench and unclench the finger muscles. As playing with a stress ball is simple enough that your loved one can simultaneously focus on other things, incorporating this activity into his or her daily life can help develop his or her hand muscles without disturbing his or her routine. Typing on a keyboard is an excellent way to develop or maintain finger strength and dexterity. Whether your loved one doesn’t know how to type or her or she is proficient with a QWERTY keyboard, there are a number of fun typing-based games that could help your loved one improve manual dexterity. Designed to teach correct and agile typing skills, these games can help seniors both develop a new skill as well as manual dexterity. If your elderly loved one is musically inclined, learning the basics on an instrument like a piano, guitar, and saxophone can offer a mentally engaging way to promote his or her fine motor skills. While it can be challenging for seniors to learn to read music and play a musical instrument, many beginner-level songs can be a manageable and fun activity that promotes strong and agile hands and fingers. Additionally, seniors can use this activity to bond with family, friends, peers, and providers of in-home care in Rhode Island. 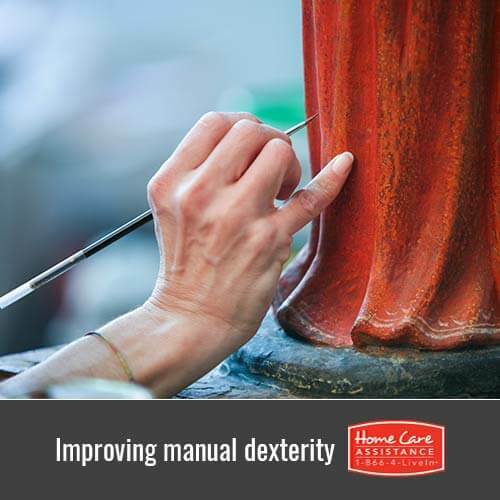 Strengthening manual dexterity can help seniors become more independent, which is an important aspect of health and wellbeing. Seniors can maintain their independence with help from Home Care Assistance, a leading provider of Alzheimer’s, Parkinson’s, stroke, and dementia care for Rhode Island seniors. With help from our expertly trained caregivers, seniors will receive the care they need with daily tasks in the comfort of home. Give your loved one the care he or she deserves without compromising his or her independence. Call (401) 284-0979 today and schedule a free in-home consultation with a dedicated Care Manager.